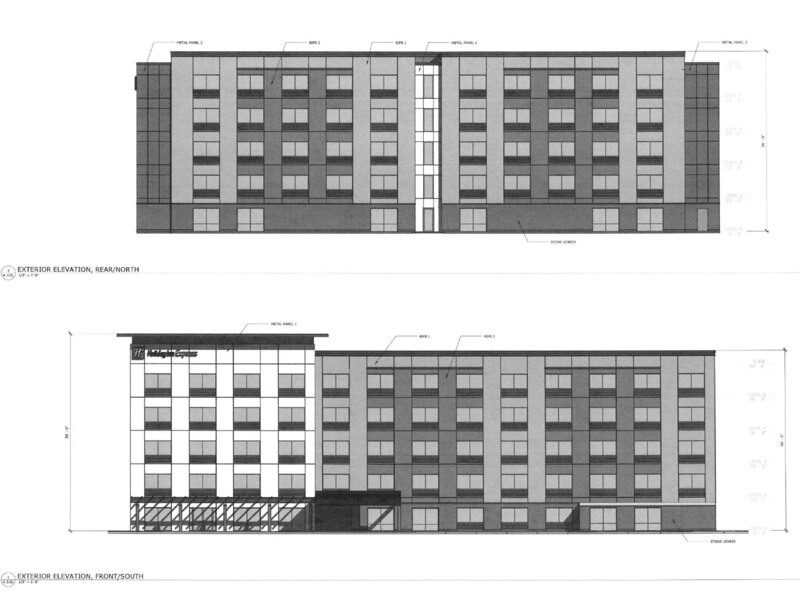 At the October 18th City Plan Commission meeting a proposal for a Holiday Inn Express on Pine Street at the west side Service Road adjacent to Crossroads RI will be presented. 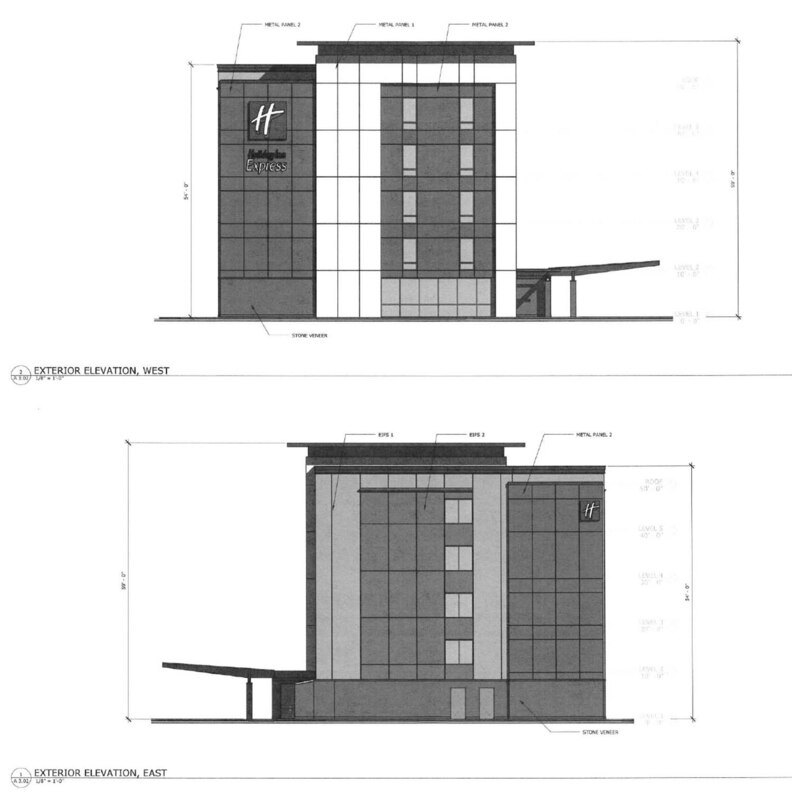 Below are renderings and plans, and a few thoughts on the proposal. 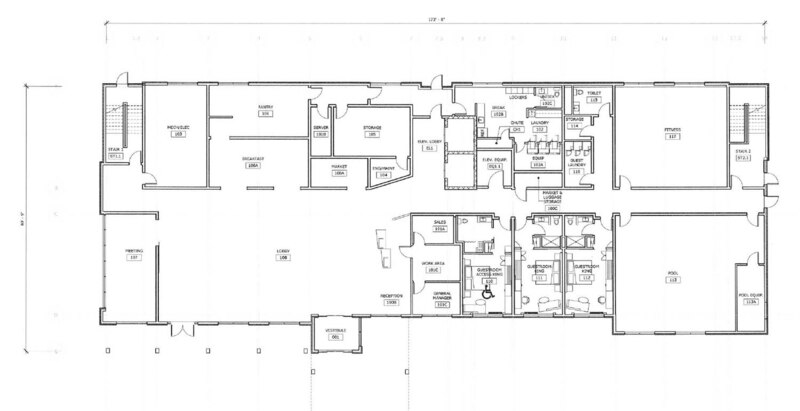 The drawings and plans are by ZDS of Providence. It would be easy for them to have their driveway off of Conduit Street eliminating the need for another curb cut onto the service road. 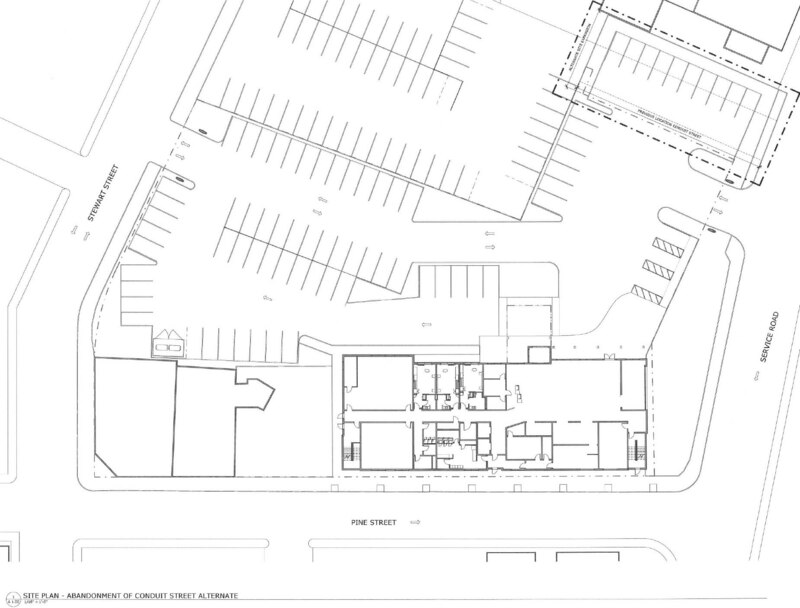 They also have an alternate site plan which abandons Conduit Street. Generally the CPC is loathe to approve street abandonments and I would encourage them not to approve this one. The street grid most certainly could and should make a comeback here with the area surface lots built on. The setback is a relic of the parcels being condemned to build Route 95. If you look at the parcel map for this area, the subject parcel is 654, you’ll see it has a bite taken out of it and does not actually reach the Service Road. There was a parcel next to it before the highway was built and before the Service Road was there. Even if they wanted to, the developer cannot build to the street as they do not own the land that reaches all the way to the street. This is a problem in various sections of the Service Road and something the City and State should address. RIDOT owns the land between the Service Road and Parcel 654. We should create a mechanism by which if an abutter plans a building along the Service Road, the State should transfer land to the abutter to allow the building to be built properly to the street. This of course should only be for buildings, we should not be giving abutters land to expand surface parking lots. The North Elevation faces the parking lot and the direction of travel on the Service Road, also southbound traffic on Route 95. The West Elevation faces the Service Road and Route 95. The building itself is meh. I could live with it as is, the CPC will probably offer some direction on the design, but it is what it is. And as we already discussed, the setback is unavoidable unless we can find a way to transfer the sliver of land between the parcel and the lot from RIDOT to the developer. In a perfect world there would be more of a presence on the ground floor along Pine Street, but Pine Street is not a heavily traveled street, retail would just wither and die there. It is unrealistic at this point. 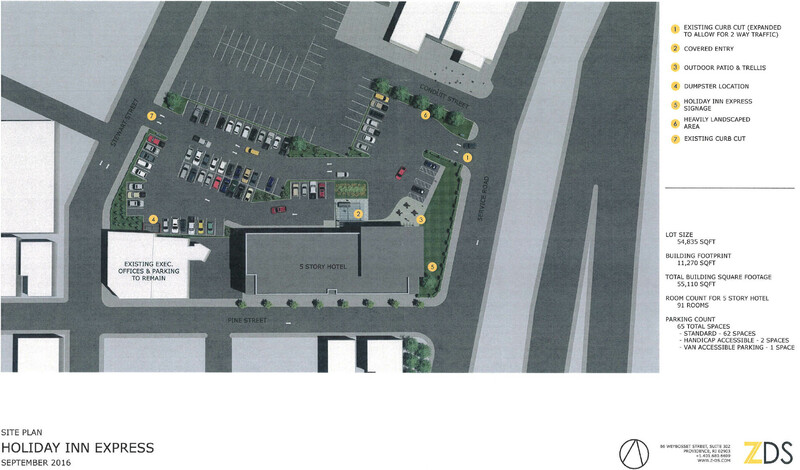 The parking lot is egregious, especially in what is supposedly a TOD zone. 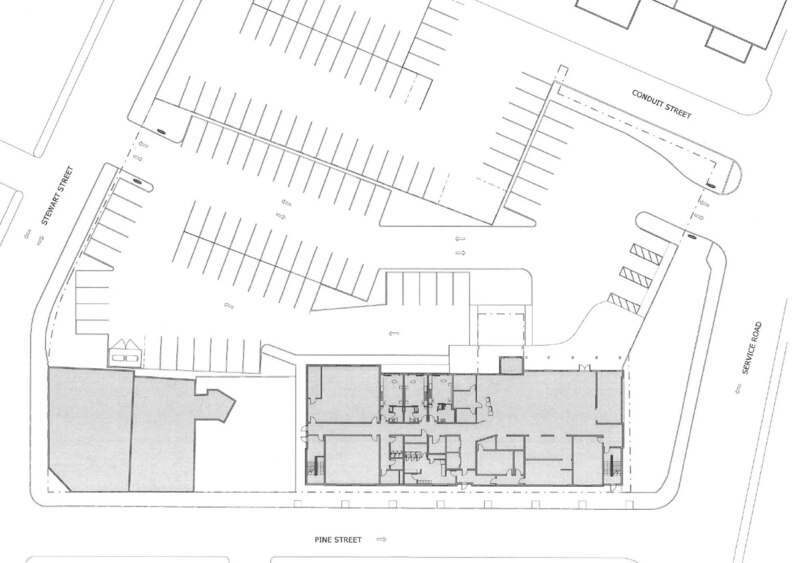 But what is most egregious about it being in a TOD zone is that the developer is asking the City for less parking than required (65 spaces rather than the required 91) at the CPC meeting. I mean, come on! What could happen here someday… Scroll up to the full-color site plan at the beginning of the post. See where there are no cars rendered into the parking lot? That is a separate parcel, actually the parcel that Crossroads sits on (it appears Conduit Street may be abandoned there). Put the driveway for this parcel on Conduit Street, and build housing on the rest of that lot, allowing Conduit to continue through to Stewart Street and beyond. The hotel’s parking lot becomes less of a blight if it has buildings on both sides of it. 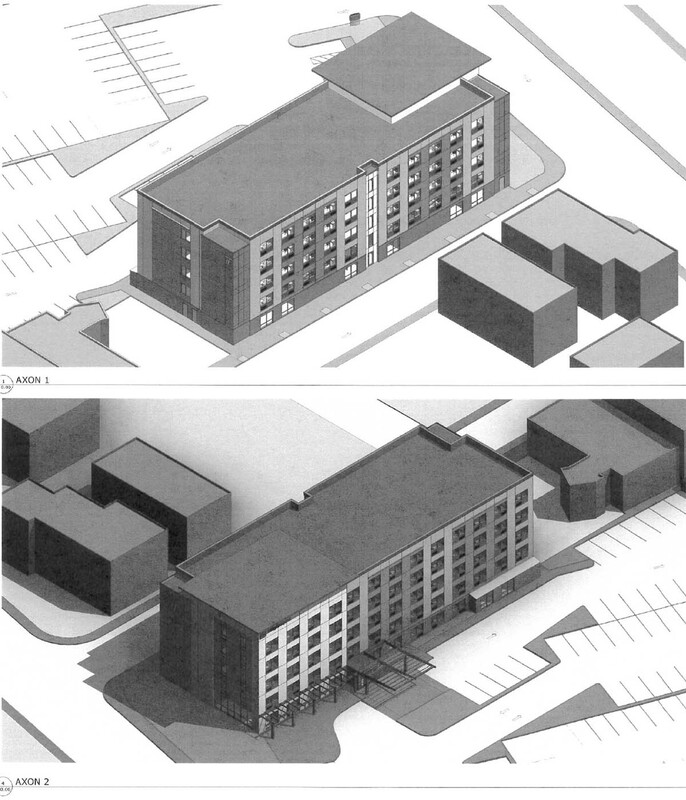 This other parcel would be a really good location for transitional housing for currently homeless individuals. It would allow for people to attain housing stability and be proximate to the services that Crossroads offers. People in this housing would be good candidates for jobs at the Holiday Inn Express. If Crossroads indeed already owns that, it seems like a no-brainer. What does everyone else think about this hotel proposal? And also, should we start some sort of pool betting on when one of the handful of hotel proposals out there is first to get shovels in the ground? I’m really confused about how they’ve labeled their elevations. Should “south” elevation be the side of the building that faces south, etc.? I don’t think that’s what they’ve done, in fact I’m sure of it. Are they asking for relief from the landscaping requirements? Because it sure doesn’t look like there’s enough canopy cover there. Would be lovely for Seekonk or Warwick. 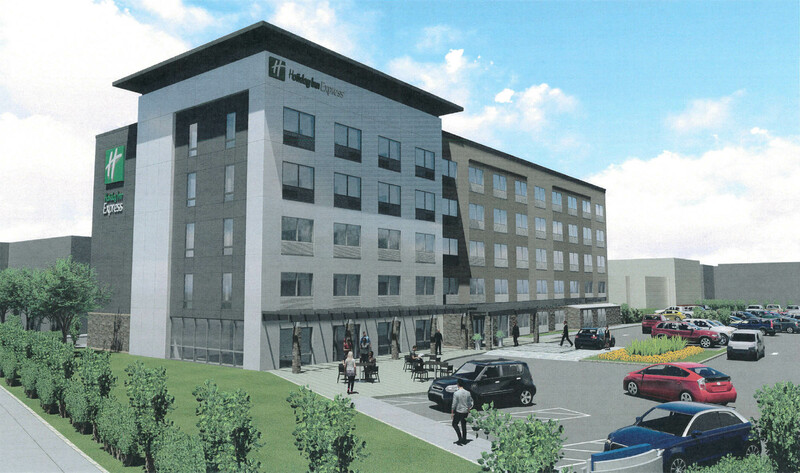 I just can’t for the life of me understand why anyone visiting Providence would want to stay in a suburban style hotel sandwiched next to a homeless shelter, sniffing and listening distance to the highway, in a place you wouldn’t want to walk to anywhere. And if you do like suburban style hotels (i.e. FREE SURFACE PARKING LOT), you probably don’t like the urban elements like a homeless shelter next to them. You’d probably keep motoring to a “safer” destination. Frankly, I’m pretty shocked anyone has interest in developing this parcel. The fact that the design is not particularly offensive and they’re even asking for less parking makes it pretty appealing to see go up as is. That area needs a revival and I hope the hotel does just that, hopefully guest are from out of town and don’t realize the condition of that area. I’m happy something is going in there, it’s a huge eye sore next to the highway. Maybe it can be an anchor point and cause a development domino effect for that area. Big parking lot though, they need a lush landscape. This is only tangentially relevant to the conversation on the building itself, but I’ve been lately trying to imagine how the city could encourage a rethinking of I-95 in achievable, manageable stages. Since we’re running up against a time clock with the 6/10 project, and likely to get (at best) a “halo” compromise, I’ve been thinking about how we could free ourselves from the RIDOT schedule on these types of things. Could an approach to rethinking the highway also help to change these awful suburban designs? It seems like so long as we’re thinking of the Jewelry District as a place that’s directly next to I-95, we’re going to get a Warwick-style design from a lot of developers. Also, as far as things go, why are we still demanding *any* parking in downtown parcels? :-/ Can’t wrap my head around it. I don’t really have any issue with this. Maybe there will be better enforcing of loitering and a reduction in litter. I’m all about connecting the downtown to the western neighborhoods, increasing pedestrian crossings will help at least change the perception that it isn’t safe to walk across 95 to downtown. Hopefully. Decking over 95 is the real solution. Air quality, connectivity, property values, tourism — all positively affected. 95 slices us through the heart and it needs to disappear under a green corridor of gardens and a pedestrian mall. I’ve always believed that the best way to implement the “core connector” would be to just run a dedicated raised bus line along the 95 corridor from the Mall to RI Hospital. The origin being somewhere close enough to walk *inside* the mall from the Train Station, with stops being Atwells/Broadway, Westminster, and a terminus at Point Street. All the talk about the 6/10 connector being a tunnel with green space and a dedicated bus lane on top got me thinking… why can’t that be done on 95 (for far cheaper). Westminster Crossings was the first to suggest it, but it really does make a lot of sense. Making the path dedicated avoids all traffic congestion issues that the Silver Line has in Boston. Actually it’s better that they set the building back from the service road. Turning out of Pine street is already a challenge, no need to make it more difficult to see oncoming traffic. Conduit street is already abandoned, its been turned into crossroads parking and has a gate across it.